Warrant Officer James Fraser, MM. Jim Fraser’s debut match for the Carlton Football Club – against Essendon in the opening round of 1922 - was remarkable for two reasons. One was that the game was the first official VFL match played at the Same Olds’ new ground in Napier Street, Essendon; a venue that in time would be christened Windy Hill. Secondly, the clash brought together Carlton players Jim Fraser and Stewart McLatchie, who shared the roving for the first time at senior level for the Blues, after both had been awarded the Military Medal for outstanding bravery under fire during the First Word War. Fraser played nine games and booted a handy eight goals in 1922. Carlton ended up fourth on the ladder, only to narrowly lose to Essendon again in a lacklustre first Semi Final. Thereafter, Jim found the going much harder, as might be expected from an athlete who had been hospitalised by exposure to mustard gas only a few years before. 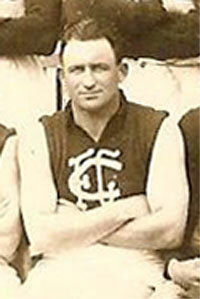 He managed five more appearances in 1923, while the Blues slipped down the ladder from fourth to seventh. Then, part way through that tough year, and with his prospects looking shaky at best, Jim handed back his number 12 guernsey and went home to Mansfield. Eight years beforehand, with his father’s blessing, 18 year-old Fraser had waved goodbye to the family grocery store, and signed up to fight the German invasion of France and Belgium. A born leader with two years of training in a militia unit to his credit, Jim rose quickly through the ranks of the 15th Battalion over the next year, as the Australian troops were pitched into some of the most costly offensives of the war. In October, 1917, Jim’s moment came – best described by the following official report from his Divisional Commander. Sergeant Fraser was acting Company Sergeant Major when he displayed conspicuous gallantry and devotion to duty near Broodseinde on the night of 17/18 October 1917, when the ration party suffered heavy casualties through shellfire. On his own iniative, CSM Fraser organised a party of details, went back and attended to the wounded of the ration party and brought the rations to the line. By this time it was daylight, but without hesitation he took his party forward from shell hole to shell hole under direct enemy observation and machine gun fire. He succeeded in delivering the rations complete to the forward positions without a casualty to his party. It was solely due to his decision and personal example that this dangerous task was accomplished. Jim was awarded the Military Medal for those exploits, and by June, 1918 had been promoted further - to Warrant Officer Class 2 – when his luck finally ran out. He was caught unprepared an exploding mustard gas shell, and his throat and lungs were seared. He was evacuated to hospital in England for specialist care, and was still undergoing treatment when an armistice ended the war in November of that year. Five days before Christmas 1918, Jim walked down the gangway from a ship docked at Princes Pier, Port Melbourne. Ahead lay the joy of homecoming, the thrill of pulling on the navy blue strip of Carlton, and a long and peaceful life in the clear air of the high country. The 368th player to represent the Carlton Football Club, and one of six Blues to be awarded the Military Medal, Jim Fraser passed away on November 5, 1975, aged 78. Contributors to this page: blueycarlton , Bombasheldon , molsey , PatsFitztrick , tmd1 , Jarusa , true_blue24 , TruBlueBrad and admin . Page last modified on Monday 14 of October, 2013 10:58:30 AEDT by blueycarlton. 1998 - Parkin Passion (pg 2 of 2) 12/08/98. 1997 Night GF - Glenn Manton stands over Steven Handley.